A source which will remain anonymous states “The Aquarian Age is the epoch of new knowledge pouring like Holy Water onto the Earth from the Creator.” If were seeking this *new knowledge* we would find a very rich source in the Age of Aries for example which gave us Pythagoras, the Buddha, Lao Tzu and great sages from all over the world, I see no evidence that humanity as a whole is more spiritual now than in any other age, One does not become spiritual because of an age. More often we do so in spite of it. I will take Zoller at his word on this, although I do not entirely share his apparent fatalistic pessimism. I am most interested in what he has to say about the angles of the Piscean and Aquarian Age, including his references to the role of Libra, Leo and Scorpio. “The Novus Ordo Saeculorum, the New Order of the Ages, will rule through the power of life and death (Scorpio, which is on the 10th), through behaviour modification, cloning, genetic engineering, mind control and the occult. Might makes right in this New Age. If the preceding Age produced metaphysical materialists, who duped the people through the opiate of religion, the New Age will produce materialist metaphysicians who will make the preceding political power elites look like inept apprentices. He says a great deal more about the prospects of the Aquarian Age, but Im suggesting that the Age is essentially Fascist in nature. The Oxford English Dictionary defines Fascism as “an authoritarian and nationalistic right-wing system of government and social organization” but this is a great simplification of what we are likely to see manifest in the Twenty-First Century. This is the *boot in the face* we associate with totalitarian regimes with little to no interest in the populace beyond what they can supply the regime. As such, they are completely expendable. How can this be? The Age of Aquarius was billed as a time of harmony, understanding and humanitarian philanthropy. This was never anything more than a utopian dream put forward by the theosophists and their heirs. When most people hear the term, they think of jack booted Nazis goose stepping through Berlin among a sea of black and red swastikas. Any high handed attack on civil liberties will, more often than not, invite comparisons to Adolph Hitler. But contemporary fascism has been called velvet fascism. I believe this is part of Zoller’s point regarding the role of Libra. Let’s take an example we are all familiar with – Political Correctness. It’s a means to silence and control. It bypasses the reasoning faculties and instead hands down unbreakable laws that have never been voted on or objectively assessed with the help of the hard sciences or the insights of anthropology. They tend to be tenets set forth by the media for mass consumption. PC is *true* because those with the most power say it is. This ‘might is right’ is at the core of fascism. Prior to the 20th Century, such systemic dogma regarding all facets of life was the domain of organized religion. Now it is political will in the service of multi-nationals and enforced by both the military and an increasingly militarized police force. This is an affront to civil liberties and intellect, but it feels very much like the fixed – humanism of Aquarius. Human behaviour is thus governed by a purely political cabal who are normally assumed to be Liberal. Oppression masquerades as moral progress. So let’s now look at the other end of the axis, the hot and dry, fixed fire sign of Leo. If I understand him correctly, I believe Zoller is particularly glib on this, writing it off a diversion in which to “do your own thing.” Surely, it is a great deal more than that. In it’s simplest terms, this presents us with a polarity of the self versus the collective. Technologically, we are faced with the paradox of *personal* devices that have the effect of merging us all into a global collective, for good or bad. The Sun is in his fall in Libra, but also debilitated in Aquarius. Abu’ Mashar refers to the sign as the “estrangement” of the Sun. As a “partner” in the 7th House, we are presented with a choice, but not an easy one. It is worthy of note that in traditional astrology the Ascendant is the patient and the 7th house the place of the physician. ( The Forty Chapters of Al Kindi p.250 ). The Sun in his own domicile makes for a powerful opposition that serves to ease the otherwise gloomy rule of Saturn. Many of the illnesses associated with Saturn, such as arthritis, are soothed by the application of heat. A partial list of saturnine ailments from Nicolas Culpeper includes tooth-ache, Melancholy, excessive cold and dryness (See Astrological Judgement of Diseases. p 76). Leo is monarchy at the other end of the axis with Aquarius and as such is part of a dynamic. The balanced offered by the polarities of any age, present us with opportunities and choices. Imperfect as it may be, this ‘patient – physician” relationship room. The Obama Presidency is a particularly poignant case in point. Obama himself could well be described as the velvet glove for the iron fist, so often associated with Libra. His success is fuelled by a combination of platitudes and charisma, but he rules mostly by executive order, repays banks with the taxes levied on the poor and working class. He reigns with the great benefit of a mostly uncritical media paid for by his masters. His rise was a wonder of commercial promotion, promising one thing and delivering the opposite. There hasn’t been a great deal of secrecy regarding the fact that he was repaying financial supporters, rather than addressing the will of those who elected him. His campaign promises have been almost entirely ignored. His protection of companies such as Monsanto, even to the extent of making it illegal to criticize the company have shown him to be little more than a shameless opportunist. We have seen citizens regarded as mere consumers with no particular entitlement, even if they paid for it. 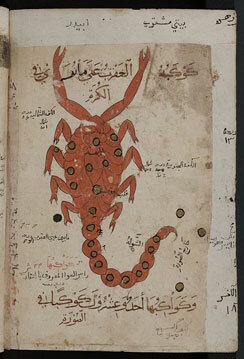 Libra – Arabic, 15th C.
Of course, Obama is only one of dozens of world leaders and they are not all like him. Most are. As we enter into the thick of the Aquarian Age, consolidation of absolute power has become commonplace. Writing about an Age / Aeon requires us to paint with a very, very large brush. This is particularly the case when there is and can be no consensus regarding the start or end of any age. However, we can make observations that reflect that age. It also helps us to find balance and avoid the extreme conditions of an age where the malefics hold sway. This entry was posted in Aqaurius, Leo, Medical Astrology, Traditional Astrology.